Luke 22:66-71; Matthew 27:1b-10, Friday, around 5 a.m. Third trial, a formal hearing before the Sanhedrin; Judas is remorseful. Matthew 27:24-30; John 19:4-16a, Friday, around 6 a.m. Pilate yields and condemns Jesus. Jesus’ third trial was held before the whole Sanhedrin in Jerusalem, that is, the ruling body of the Jews there. It appears that this trial was legal. Note that what Jesus actually answered in Luke 22:70 was, “You say that I am!” That seems to be what most translations have (with or without the exclamation mark, but the Greek is emphatic, so I put it in). Weymouth’s translation is different from most. Personally, I like the International Standard Version: “You said it, I AM.” You may remember from our study of the names of God that I AM is one of the most sacred names, and since the Sanhedrin immediately decided that Jesus was guilty of blasphemy, this may well be how they took what he said. The sentence for blasphemy was death. The Jews, however, could not impose a death penalty, so they bundled him off to the Roman governor, Pilate. By the way, I was surprised to learn that there was apparently a Sanhedrin in every sizable Jewish community. Presumably this is why Jesus says in Mark 13:9 and Matthew 10:17 that his followers will be delivered to the “Sanhedrins” (or “councils,” depending on your translation). There was more than one. Nevertheless, the only specific Sanhedrin I can find a New Testament reference to is the one in Jerusalem. 1b-2 All the High Priests and the Elders of the people consulted together against Jesus to put Him to death; and binding Him they led Him away and handed Him over to Pilate the Governor. Fellow-reader Donna B. recently taught me a new expression: “Not my circus, and not my monkey.” It means that whatever the situation is, it is not my problem! Jesus’ fourth trial was a hearing before Pontius Pilate. Pilate doesn’t come across as a strong character, although to be fair he was in a difficult situation. He was governor of Judea (a province full of notorious troublemakers), and the capital city of Jerusalem was a tinderbox packed with people who had come into town for the Passover. Now the religious leadership wants him to crucify the most popular man in the country, although he can’t find any reason to impose the death penalty. Imagine Pilate’s relief when it turns out that the man is a Galilean: Jesus is not his problem! 11 Meanwhile Jesus was brought before the Governor, and the latter put the question, “Are you the King of the Jews?” “I am their King,” He answered. 12 When however the High Priests and the Elders kept bringing their charges against Him, He said not a word in reply. 13-14 “Do you not hear,” asked Pilate, “what a mass of evidence they are bringing against you?” But He made no reply to a single accusation, so that the Governor was greatly astonished. 31, 2 “Take him yourselves,” said Pilate, “and judge him by your Law.” “We have no power,” replied the Jews, “to put any man to death.” They said this that the words might be fulfilled in which Jesus predicted the kind of death He was to die. 34 “Do you say this of yourself, or have others told it you about me?” replied Jesus. 38 “What is truth?” said Pilate. But no sooner had he spoken the words than he went out again to the Jews and told them, “I find no crime in him. Pilate was onto the idea that Jesus was a Galilean like a duck on a June bug. Herod, the Tetrarch of Galilee, was in town for Passover, so Pilate immediately sent Jesus on to him. This is the same Herod who had had John the Baptist beheaded at the demand of his step-daughter; Jesus doesn’t even dignify Herod’s questions by answering them. Herod, getting nothing out of him during this fifth trial, sends Jesus back to Pilate. 7 And learning that He belonged to Herod’s jurisdiction he [Pilate] sent Him to Herod, for he too was in Jerusalem at that time. 8-9 To Herod the sight of Jesus was a great gratification, for, for a long time, he had been wanting to see Him, because he had heard so much about Him. He hoped also to see some miracle performed by Him. So he put a number of questions to Him, but Jesus gave him no reply. 10 Meanwhile the High Priests and the Scribes were standing there and vehemently accusing Him. 11-12 Then, laughing to scorn the claims of Jesus, Herod (and his soldiers with him) made sport of Him, dressed Him in a gorgeous costume, and sent Him back to Pilate. And on that very day Herod and Pilate became friends again, for they had been for some time at enmity. Finally we’re getting to Jesus’ sixth and final trial, before Pilate. Pilate hadn’t found any crime that Jesus was guilty of, but (probably with relief) he sent him off to Herod. Herod, a Jew, couldn’t find anything either, and he sent him back to Pilate. Now Pilate’s wife weighs in, saying that Jesus is innocent. Pilate really doesn’t want to execute Jesus, and he really doesn’t want a riot. 13-16 Then calling together the High Priests and the Rulers and the people, Pilate said, “You have brought this man to me on a charge of corrupting the loyalty of the people. 15-16, 19 Now it was the Governor’s custom at the Festival to release some one prisoner, whomsoever the populace desired; and at this time they had a notorious prisoner called Barabbas. – Barabbas! who had been lodged in jail for some time in connection with a riot which had occurred in the city, and for murder. 17-18 So when they were now assembled Pilate appealed to them. “Whom shall I release to you,” he said, “Barabbas, or Jesus the so-called Christ?” For he knew that it was from envious hatred that Jesus had been brought before him. 20 But Pilate once more addressed them, wishing to set Jesus free. 23 But they urgently insisted, demanding with frantic outcries that He should be crucified; and their clamor prevailed. The Roman occupiers were stern, but they were reasonably law-abiding and even-handed. Neither Pilate nor Herod could find any capital offense that Jesus might be guilty of, and Pilate didn’t especially want to inflict the death penalty. On the other hand, he couldn’t afford a riot in the crowded city of Jerusalem, which would get a lot of people killed and – probably more importantly to Pilate – get him in trouble with Rome. He tried to work out a compromise with a severe beating and humiliation of Jesus. But pay careful attention to John 19:7-8. Pilate wasn’t really alarmed until he found out that Jesus was accused of saying that he was the Son of God. The Greeks and Romans had a long list of demigods, many of whom were the offspring of a god and a mortal. (Hercules is probably the one you’d recognize right off the bat.) Demigods were not as powerful or important as gods, but they weren’t to be trifled with, either, and arresting a demigod would certainly explain his wife’s dream. Pilate immediately returns to Jesus to demand an explanation, but he doesn’t get one. Finally, the priests implicitly threaten to tell Rome that Pilate is trying to release a man who is claiming to be king (rather than Caesar). Pilate can’t take any more of this, and he gives in. 26-27 Then he released Barabbas to them, but Jesus he ordered to be scourged, and gave Him up to be crucified. Then the Governor’s soldiers took Jesus into the Praetorium, and called together the whole battalion to make sport of Him. 28-30 Stripping off His garments, they put on Him a general’s short crimson cloak. They twisted a wreath of thorny twigs and put it on His head, and they put a sceptre of cane in His right hand, and kneeling to Him they shouted in mockery, “Long live the King of the Jews!” Then they spat upon Him, and taking the cane they repeatedly struck Him on the head with it. 8-9 More alarmed than ever, Pilate no sooner heard these words than he re-entered the Praetorium and began to question Jesus. “What is your origin?” he asked. But Jesus gave him no answer. 13 On hearing this, Pilate brought Jesus out, and sat down on the judge’s seat in a place called the Pavement – or in Hebrew, Gabbatha. “Am I to crucify your king?” Pilate asked. “We have no king, except Caesar,” answered the High Priests. 16a Then Pilate gave Him up to them to be crucified. Holy Week: Wednesday Part 2, Be Ready! Copyright 2014 by Regina L. Hunter. All rights reserved. Scripture readings are from the Weymouth New Testament (1912); caps indicate quotations from the Old Testament. 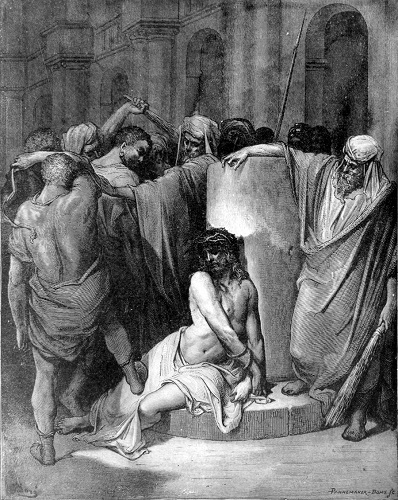 "The Scourging of Jesus" by Gustave Doré is from the Thomas family Bible, now in a private collection of a family member.This page has been prepared for the web site by RPB. Opinions expressed on this page are solely those of the author, Regina Hunter, and may or may not be shared by the sponsors or the Bible-study participants. Thanks to the Holy Spirit for any useful ideas presented here, and thanks to all the readers for their support and enthusiasm. All errors are, of course, the sole responsibility of the author. Traditional worship services are held Sundays at 8:15 and 11:00 a.m. in the sanctuary. Casual worship services are held Sundays at 9:30 a.m. in the Family Life Center. Jazz Vespers are held monthly on the second Saturday at 5:00 p.m. in the sanctuary. St. John’s feels especially called to the worship of God and to the service of our neighbors through our music program. Get a free demo of our computer adventure game, full of hidden-object puzzles, tiling and jigsaw puzzles, cycling puzzles, and more. Computer games that children can play all by themselves! Ducks in a Row, Inc., developers of Home Safe SoftwareTM. Keep It SafeTM - Home inventory software so easy anybody can use it.